The objective of this program is to provide an opportunity for those manufacturers wholesale fashion, dealers, shops, boutiques or department stores that want to get rid of their stocks of clothing and footwear to devote to development cooperation. Alcampo, C & A, Sara Lee and Eroski are some companies that have worked with humans in this program. To this end, Humana is committed to conducting effective management, efficient and professional these stocks. With this, the companies participating in DESTOCK.A help improve your corporate image and develop their Corporate Social Responsibility programs, obtaining a tax of 25% of the value of donated goods. 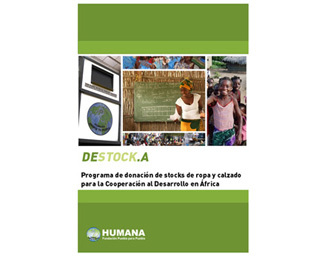 Humana is also committed to provide maximum social value stocks of clothing and footwear, to value the brand image of the partner companies and provide maximum information to the donor on the fate of clothing and the proceeds for development cooperation. Through this program, Humana will provide various vulnerable populations in Africa access to education and job placement that will contribute to community development, improving living conditions through projects carried out in the field of prevention communicable diseases such as HIV / AIDS. Be made available also to community development, agricultural and rural, including food security actions to help children.